Last year Dr. Bernadine Evaristo and a team of Creative Writing students brought us ‘The Voices Inside Our Heads’, Brunel’s first anthology of student-written short stories and thanks to its success, they’ve decided to do it again this year! 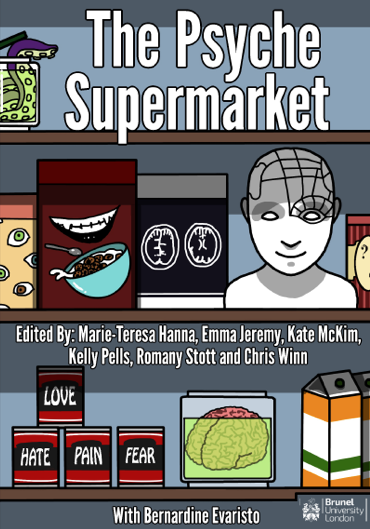 ‘The Psyche Supermarket’ will introduce readers to yet another wave of young and creative student writers. There’s no boundary on what they can write which, mixed with their variety of backgrounds and personalities, will make for an eclectic collection of stories that range from the colourful to the downright bizarre. Love, comedy, fear and intrigue; these are just a few of the things you can expect to find down the aisle of ‘The Psyche Supermarket’! The anthology will also be edited by a student team consisting of BA students Marie-Teresa Hanna, Kate McKim, Kelly Pells, Chris Winn and MA students Emma Jeremy and Romany Stott (who were also editors on the first anthology). The launch of the anthology will be on the 11th of March at 7pm in the Antonin Artaud building as part of the monthly Arts @ Artaud event. As well as selection of readings from students in the anthology there will also other performances, not to mention the possibility of free wine. At some point in the night the anthology will go on sale at £5 but you’ll have to be quick because there’s a limited supply! Something like this is a great opportunity for an aspiring writer and it deserves all the support it can get so please, if you get the chance to, drop by for a drink and watch some amazing new talent being showcased, maybe even grab a copy of the anthology. For more updates on the anthology then check out the official Twitter account @CWBrunel or look no further than this blog where we’ll be hosting daily interviews with the writers featured in ‘The Pysche Supermarket’ starting the 16th of February!